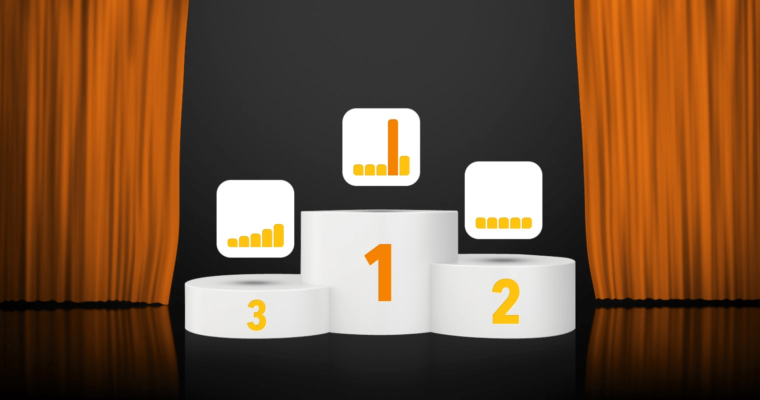 How does one measure the efficiency of multi-channel advertising campaigns? How should one manage the budgets of overlapping marketing channels in order to increase profits but not to risk spoiling the existing mechanism? If these questions are appearing more often in your business, then it may well be time to address attribution modeling. A chain store is present in dozens of shopping malls throughout the entire country. Products are also sold online and via television shopping channels. The sales are powered by a number of advertising activities: TV, billboards, newspapers and magazines. The online promotion includes search engines, social media, YouTube, affiliate networks and RTB, to name only the most important. All the agencies responsible for the above channels report on the efficiency of their ads. The advertiser’s confidence in these reports is limited, because if you sum up the effects claimed by each of them, the sales ought to be a couple of times higher than it actually is. Is it the case that someone is prevaricating, but we don’t know who? What is the advertiser’s recourse? The answer is attribution modeling. 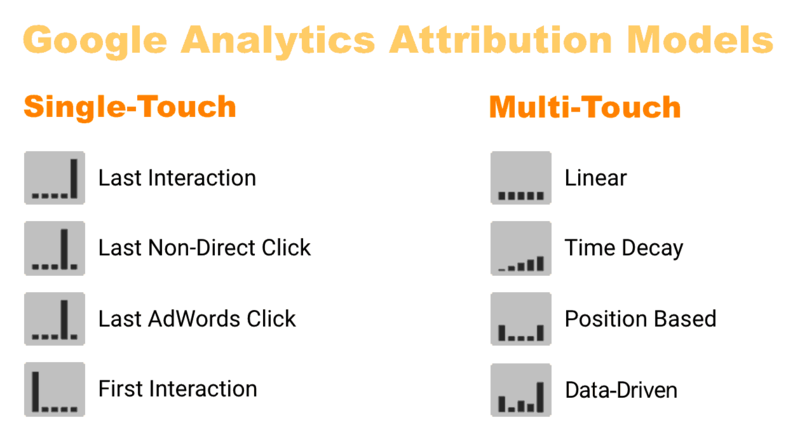 Attribution modeling analyzes how overlapping marketing channels combine and assigns value to each of these channels in a manner that most fairly reflects their contribution to the overall result, which is measured by the number of conversions or revenue. In online marketing, at the first sight, this looks easy. Conversion tracking systems measure conversions by traffic source and show how much revenue was produced by each source. 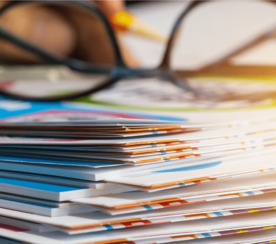 It becomes more complicated when you realize that the conversion is usually preceded by numerous visits from different sources, and all these sources claim the right to share in the total sales results. 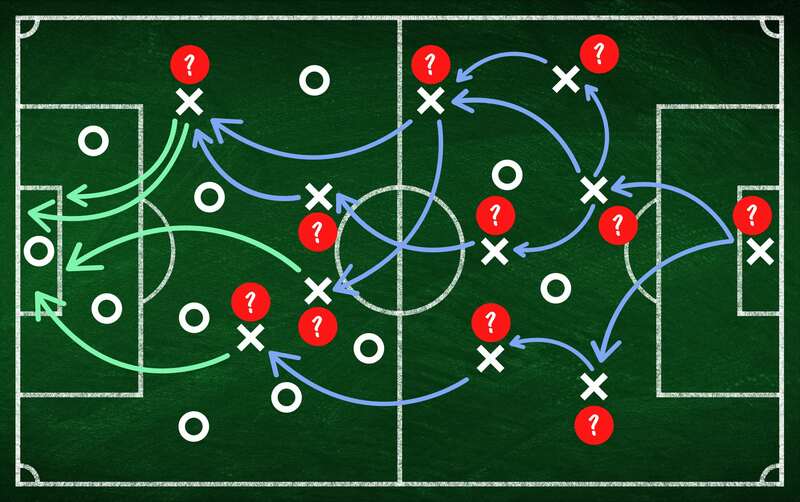 You might compare it to a team game, where each player contributed to the final result. In this approach the other players were just a background, and the three players who scored ought to divide the reward proportionally to the number of goals scored. However, it’s obvious that strikers didn’t win the match alone. If the other players aren’t being sufficiently rewarded, their performance will suffer. This division of reward, while fairer, is still far from perfect. Couldn’t we just determine that each player made the same contribution to the total result? Some players are crucial for the team, and if we replace them with others, the chance to win will decrease by two or more. Strikers are superstars for a reason. If a football club saves on strikers, one has reduced chances for a championship. 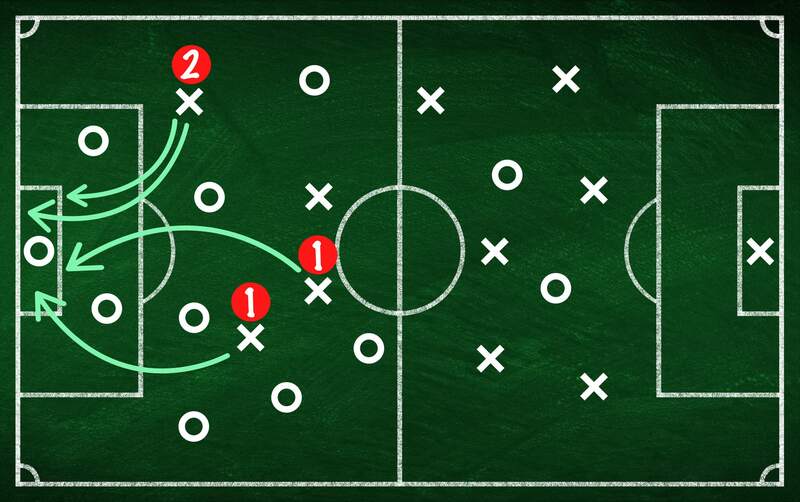 Ability to estimate the value of players is one of the key competencies of any football team manager. The vast majority of campaign performance reports assign conversions and their value to the last click. This is how the standard Google Analytics reports work, as does conversion tracking in AdWords and in other PPC advertising systems. 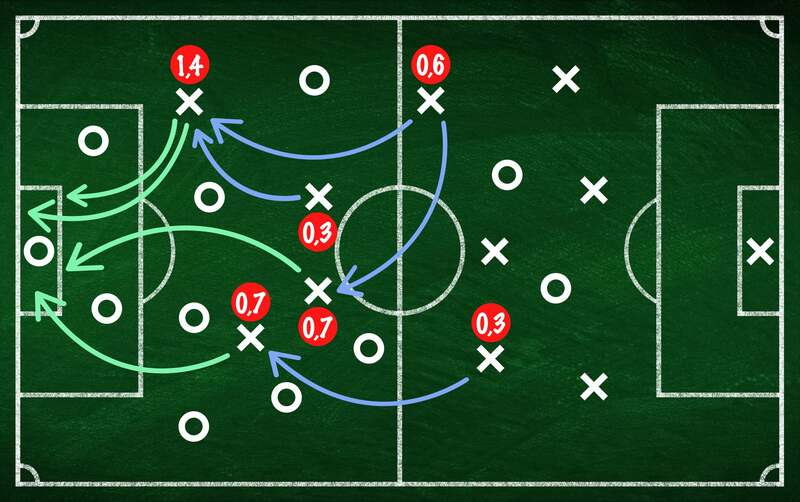 In this model the entire result of the match is attributed to players who touched the ball last, also if they barely touched it or even if it was an own goal. In the “last kick” model, the goalkeeper, who practically never scores a goal, seems to be a redundant cost. As in any analogy, the comparison to a football match shouldn’t be used literally. You can modify these models by setting the conditions that the clicks on the conversion path should meet in order to be assigned to the conversion. For example, you can create a model where the conversion is attributed to the last interaction before the purchase, unless it’s a direct visit, brand-related search click, remarketing banner click, or a visit from a newsletter. 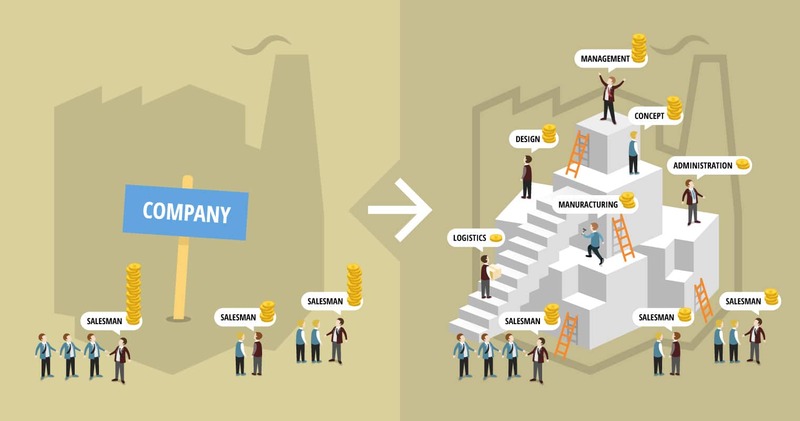 This way you reward sources responsible for the acquisition of the customers instead of sources who only assist in the last stages of the purchase decision process. The model used in the standard Google Analytics reports is the last non-direct click. Direct visits made by returning users do not override the original source of traffic. Data Driven Model: Algorithmic model which analyzes all conversion paths in the account and assigns relevant values to interactions depending on their importance to the conversion process (available in Analytics 360, and in simplified version also in AdWords and DoubleClick Search). These models can be also modified, for example, by assigning higher value to visits with higher user engagement (e.g., time on site, number of pages visited) as well as by increasing or decreasing the importance of certain interactions (e.g., direct visits, brand-related search visits, ad impressions without click). Which of the models is the best? 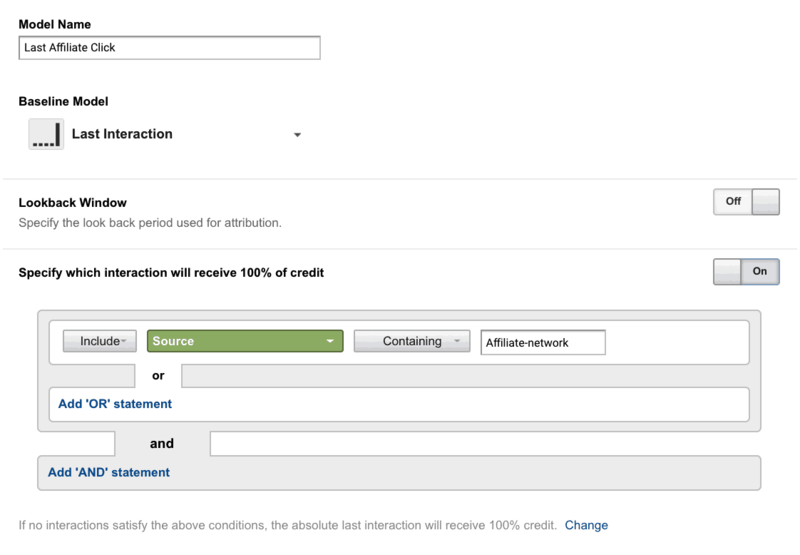 The wide range of attribution models available in Google Analytics was created with a purpose. Advertisers can adapt these models to their own needs and the unique conditions of their business. A perfect attribution model would assign to each advertising channel a value equal to the loss of revenue that would occur if the given channel was removed. However, the only way to verify the accuracy of such a model is A/B testing done on users’ buckets, where one of the groups is exposed on a certain marketing channel and the other is not. Unfortunately, this type of test is currently available only in case of remarketing (see the Google Analytics help article). This limitation applies also to the data-driven attribution model. The algorithm used in this model doesn’t do tests, but only compares interactions on different conversion paths and based on this data, seeks conclusions regarding their importance to the conversion process. Sounds a little complicated, doesn’t it? Instead of trying to guess the perfect attribution model for your business, you are probably better off analyzing different models, using them as hypotheses and comparing how the share in conversions changes for different advertising channels. Very often, different models will show similar attribution for some channels. In these cases, the attribution modeling does not matter to you so much. However, if a significant difference occurs, it is a signal that you should look closer at the role this channel plays in the conversion process. Before you start attribution analysis, it’s worth creating your own custom channel grouping in Google Analytics, instead of using the system-defined Default Channel Grouping. It’s worth merging similar traffic sources into one channel (for example, all price comparison shopping websites or all referrals from blogs). On the other hand, some sources are worth segmenting, if you suspect that these segments can play a different role in the conversion path. For example “Paid Search Traffic” should be divided to “Brand Paid Search” (search queries related to the advertiser’s own brand) and “Non-Brand Paid Search”. Don’t create too many channels. A good custom channel grouping normally should not include more than a dozen channels, and the traffic not assigned to any grouping (reported as “Other”) should be responsible for a small fraction of all conversions. One of common problems are the discrepancies across different reporting systems. Google AdWords and Google Analytics, as well as the affiliate conversion tracking system, show completely different values. However, the main reason for these discrepancies is the different attribution model used by these systems. 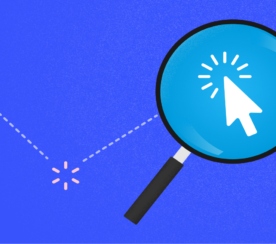 Both AdWords and affiliate marketing systems use the last click attribution model. However, it’s the last click of the ad served by a given system! So, the AdWords attributes conversions to the last AdWords click. All the other interactions, including affiliates, are not visible to AdWords conversion tracking. The same is true in the case of the affiliate systems: the conversion is attributed to the last click of the affiliate link, whether or not it’s followed by AdWords clicks. Both systems will claim “their own” conversions, but part of the conversions will be shared by both AdWords and affiliates. First, we must create a Google Analytics attribution model identical to the model used by the affiliate system, the “Last Affiliate Click” model. 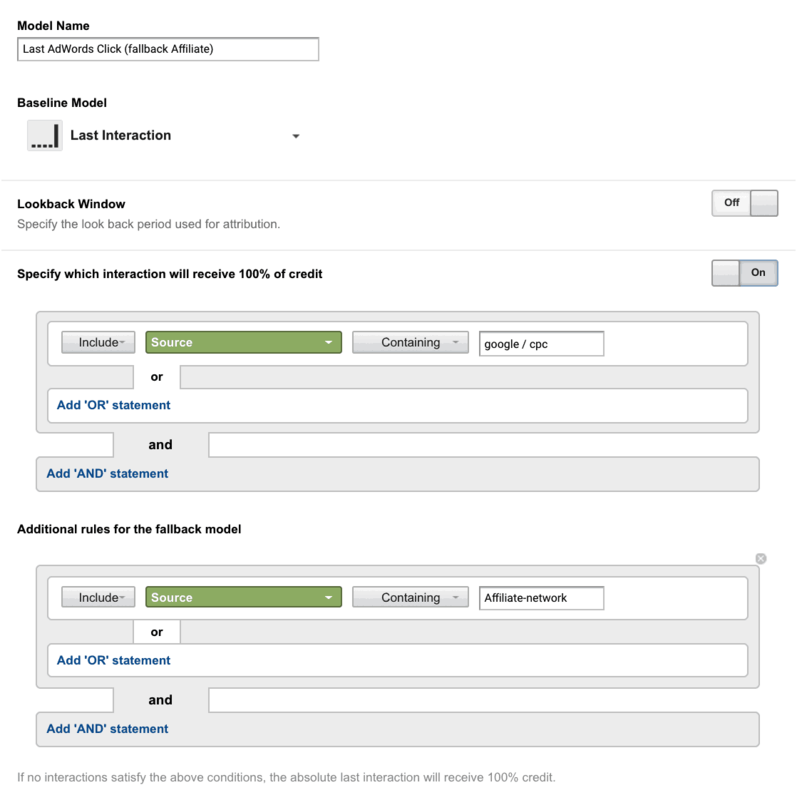 Google Analytics includes a pre-defined Last AdWords Click model, but you have to modify it. In our new, custom Last AdWords Click (fallback Affiliate) model, you have to define a fallback model and attribute the conversions to the last affiliate click – if there were no AdWords clicks on the conversion path. 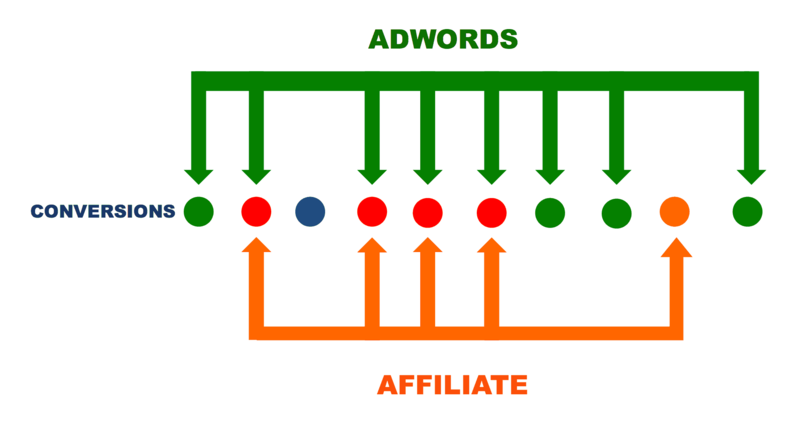 Comparison of these two models shows how much AdWords and affiliate traffic overlap. 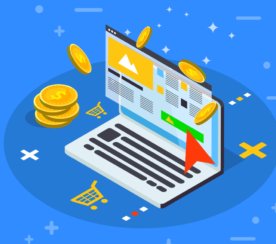 In the example below, the analysis has shown that 86 percent of conversions claimed by the affiliate system are made by users who also clicked an AdWords ad. Further analysis focused on a conversion segment including the overlapping traffic. A modified linear model, where the conversion is attributed only to AdWords and affiliate system, has shown that AdWords traffic occurs on the common conversion paths a couple of times more often than affiliates. Position based and time decay models (and modifications of these models giving more credit to visits with higher engagement) have shown that for conversions claimed by both AdWords and affiliates, AdWords visits are more frequent and have higher engagement. They also more often initiate and close the conversion path. The affiliates usually assist as the middle interaction on long conversion paths. Based on this data, the advertiser is able to estimate that the conversion value of affiliate traffic is couple of times smaller than that of AdWords, which is much less than the affiliate system claims. In the example above, the results of analysis did not give unambiguous answers regarding the impact of the affiliate program on the total volume of conversions, nor how to attribute the share in “common” conversions between AdWords and affiliates. Google Analytics reports conversions correctly. AdWords and Affiliate programs strongly overlap. The comparison of different models made possible to set the range ‘from-to’ of the attribution and to estimate the probability of different scenarios. The conclusions were sufficient to make business decisions, such as modification of the CPA for affiliates or ban for SEM affiliates who cannibalize the company’ own SEM activities. Attribution modeling can be compared to a bonus system in an enterprise. Who should get the higher bonus? Some people say the salesmen because their work has direct impact on the sales result. High bonuses will motivate them to work harder and will attract the best salesmen on the market. This approach, though common, is also short-sighted. If the product isn’t innovative and has an old-fashioned design, it may be difficult to sell. Companies with bad management and logistics may have difficulties delivering the purchased product. Bad quality may increase refunds. Bad reviews will make the salesmen work even harder. On the other hand, a good product may sell without additional effort. The salesmen, despite a smaller percentage share of bonuses, may actually earn even more if the product sells well. For this reason it’s important to appreciate not only salesmen, but the entire team. Also in online marketing, improved attribution modeling can help to increase sales. See the example below. This advertiser has noticed that the brand keywords behave like salesmen, who stand at the company’s doors, grab the incoming visitors by the hand and shout “I found a customer”. Changing the attribution model helped to identify the value of keywords that are responsible for the real acquisition of new customers. AdWords Non-Brand: generic keywords related to their business “travel agency”, “last minute Hawaii” “all inclusive Jamaica”. The company estimates that the customer acquisition is profitable if the cost per acquisition is lower than $100. For this reason their SEM campaigns are optimized towards this CPA goal, using Last AdWords Click attribution model. The AdWords Non-Brand channel produces few conversions. The CPA is $97.52, which is close to the maximum acceptable value. This means that there is no space to increase bids and buy more traffic. The AdWords Brand channel has low CPA = $1.76. It’s natural because this traffic comes from users who have already heard about the advertiser or maybe even are loyal customers. This campaign is run mainly in order to prevent competitors from displaying their ads above the Aurora Travel link. It’s rather about brand protection than the real acquisition of customers. The average ad position is close to 1.0, therefore increasing bids won’t help to increase the traffic. Let’s change the attribution model and credit the conversion to the last AdWords Non-Brand click, if it occurred on the conversion path, even if it was followed by AdWords Brand click. This model assumes that AdWords Brand has the same value as direct traffic. The comparison shows that 30 conversions from AdWords Non-Brand channel were “stolen” by the AdWords Brand campaigns (23 vs. 53 and 55 vs. 25 conversions). In the Last Non-Brand AdWords Click model, the AdWords Non-Brand keywords produced 130 percent more conversions and the conversion cost fell to $42.32, which is much less than the target CPA = $100. It means that there is an excellent opportunity to increase investment in non-brand keywords. The advertiser decides to raise bids and acquire more traffic from non-brand campaigns. The number of conversions for AdWords Non-Brand channel has increased by 164 percent (from 53 to 140 conversions) and the total sales more than doubled (from 78 to 165 conversions). However, after the change the AdWords Brand keywords also were much busier, although the total cost of this channel grew only from $97 to $160. The example above shows that attribution modeling doesn’t require the creation of complicated models. A simple change of attribution helped to increase sales, and it may be a good start on further research. Hint: A simple and bulletproof way to implement the Last Non-Brand AdWords Click attribution model in Google AdWords is moving the brand keywords to another AdWords account with separate conversion tracking (i.e., don’t use cross-account conversion tracking). Of course, it applies to Bing Ads and other SEM PPC systems too. Attribution modeling isn’t a goal in and of itself. It’s a tool that helps better to understand the complexity of multi-channel conversion funnels and to create hypotheses regarding the value of particular channels. The ultimate verification, however, can be only the result of tests, whether the changes made in campaigns helped to achieve business goals. Screenshots taken by author, October 2017.